No …..Make sure you get there early for a good spot! ► Will there be showering facilities? 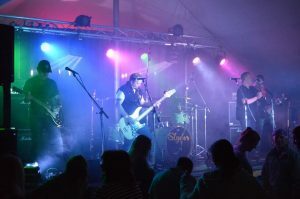 Staffs Fest is committed to making the site accessible for those with disabilities. However, as it is a festival site there are areas of uneven ground that could make access difficult. Stewards and medical team members will be on hand to help if you require assistance. There are toilet blocks and designed for wheelchair use. ► Is disabled parking available at the events? There is disabled parking on site upon arrival please ensure you show your disabled badge to be directed to the appropriate car park. Yes you can if wearing your wristband. 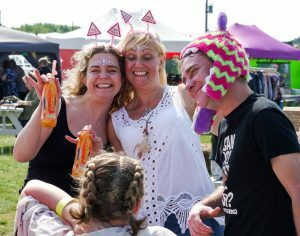 Please note that alcohol is not permitted in the Main Arena from the campsite or main entrance. 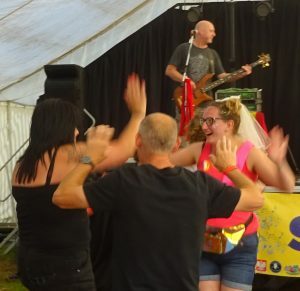 The main marquee has a fully stocked bar supplied by UK BARS with a range of real ales, lagers, ciders spirits and wine available at pub prices. Mobile reception is generally pretty good but the large amount of people on site could have an adverse affect on connection. ► How much money will I need at the festival? We have bars, catering stands, accessories stores. There is card facilities at the main bar and ATM in Penkridge We recommend you bring enough money to see you through to the end of the event. ► Are dogs allowed onsite? Yes. Dogs are allowed on the campsite and in the arena, but must be kept on a lead at all times. There is a designated dog walking area adjacent to the camping field—please use this and pick up after your dog. The Staffs Fest has a strict policy that does not tolerate drug use. You will be searched on entry to the campsite and arena. Anybody caught in the possession of drugs will be ejected from the site. Dealers and class A users will be reported to the police. Please note that all ‘legal highs’ including nitrous oxide are also prohibited. 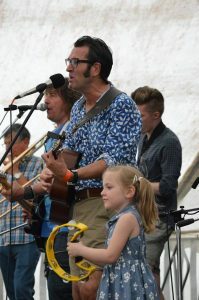 This is a family friendly festival and we aim to keep it that way. Please drink responsibly whilst on site. You are allowed to bring a reasonable amount of your own alcohol on to the campsite. BUT PLEASE NOTE THAT YOU ARE NOT ALLOWED TO TAKE ANY INTO THE MAIN ARENA. We reserve the right to refuse admission at all times. Any unseemly or un- sportsman like behaviour exhibited in any section of this festival will result in the person concerned liable to immediate removal and being banned from the Lower Drayton Farm for 3 years.